Optimum Nutrition Essential Amino Energy Tea is made with Real Tea helping deliver Caffeine from Natural Sources. 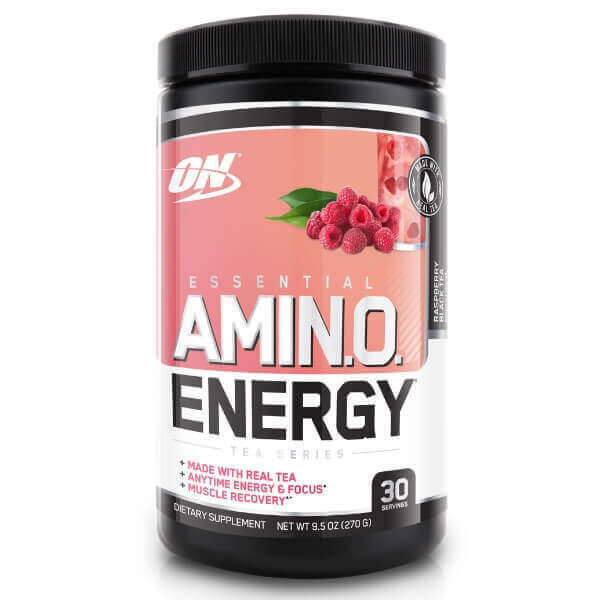 Amino Energy Tea Series delivers 160mg of Caffeine from a Mix of both Green Tea Leaf Extracts and Green Coffee Bean Extracts plus the normal powerful punch of Branched Chain Amino Acids plus Essential Amino Acids. Micronized Taurine – Great for electrolyte balance and brain function. Micronized L-Glutamine – Great for Gut health and digestion. Micronized L-Arginine – Important Amino Acids for Nitric Oxide production in the body. Micronized L-Leucine – essential in helping protein synthesis and muscle repair. Beta-Alanine ( as CarnoSyn)- Helps promote great muscular power and strength. Micronized L-Citrulline – Helps to regulate Nitric Oxide and remove toxic waste produced by Anaerobic forms of activity. Micronized L-Isoleucine – 1 of 3 Amino Acids essential to the Branched Chain Amino Acids matrix BCAA’s. Micronized L-Valine – Important amino Acidto help protect the central nervous system. Micronized L-Lysine Hydrochloride – Helps to protect the immune system specific to treating simplex Virus. Micronized L-Histidine – Helps to support the healthy manufacturing of White and Red Blood cells. Micronized L-Phenylalanine – Helps to improve Mood and help manufacture protein within the body. Micronized L-Threonine – Essential in the production of Collagen within the body and joint health. Micronized L-Methionine – Essential to the body making creatine but also s-adenosylmethionine ( SAMe) great for brain function and immune health. Mix Two Scoops of Essential Amino Energy in cold water and enjoy a refreshing Energy boost before, during or even after exercise.